Farmers Automotive. 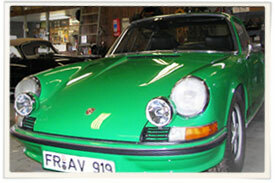 Experts in Porsche performance and repair. Located in Greenfield, Indiana. This extremely rare Carrerra RS was featured at the Monterey Auction on ESPN2 and ESPN Classic. Sign up here to receive special offers, helpful hints, and Porsche news. Looking for directions? View maps to our location. Website hosted by: Code Blue Networks, LLC.